The groundbreaking discovery of the sanctuary of Artemis Amarysia near Eretria, on Euboea island (Greece), has incited the Hellenic post to issue a stamp bearing the image of Artemis. The existence of the sanctuary of Artemis Amarysia, one of the main places of cult in Euboea, was known since Antiquity thanks to litterary sources and stone inscriptions. Yet its exact location remained elusive. Based on the research of Denis Knoepfler, Honorary Prof. at Neuchatel University and Collège de France, the Swiss School of Archaeology in Greece (ESAG), directed by Karl Reber, Prof. at Lausanne University, has initiated extensive excavations for the past ten years near the village of modern Amarynthos. Several buildings have been unearthed, among which a 4th c. BC portico. In 2017, conclusive evidence was obtained for the identification of this monumental complex as belonging to the sanctuary of Artemis Amarysia: a series of terracotta tiles stamped with the name of the goddess Artemis, as well as several stone inscriptions bearing the name of the triad, Artemis together with her brother and mother, Apollo and Leto. 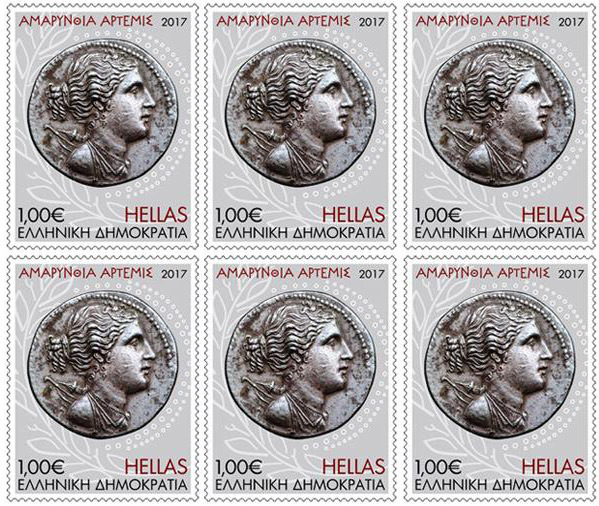 Commemorative postage stamp issued by the Hellenic Post to mark the discovery of the Sanctuary of Artemis Amarysia in 2017.